My original plan was that every 5 weeks would be bloopers week and I’d post up some bloopers footages from the previous 4 episodes. However, I am not sure if there’s going to be a change of plan, because I realized that as time progresses, I would mess up a lot less often. So yeah, but every now and then there would be a bloopers video. It sort of documents my filming process, and gives you a little glimpse into how these things are made. Regular episodes resume next week. We’ll be introducing new characters in the near future (probably next week, but I am not sure yet). Stay tuned! In Episode 3 – Crazy Names I needed to put two characters on the screen at the same time but all I have was one puppeteer (me). Now how do we accomplish that? Before I go into that, let me refresh your memory with these three screen shots, each representing one way of putting two characters on screen. There are three methods, each with its own advantages and disadvantages. How it works: By… putting a puppet in each hand? Simple enough. In fact, that’s how Episode 1 – Making a Podcast is done. Pros: No tricky editing required, yay! Cons: Talking heads only. There are absolutely no arm movements. Also, the character operated by my left hand (in this case, Bottle Monster) has worse lip-sync because I am right-handed. How to recognize it in this video: Neither character’s arms are moving. How it works: Film one (or both) characters in front of a solid green background. In editing, all pixels that’s green will be removed and replaced with something else. Pros: You can do this as many time as you want (meaning, you can have 100 characters on the screen at the same time if you want) provided that you can get the lighting right and bother to do many passes on shooting. Cons: For something that’s home-made, it’s hard to have a green screen that’s perfectly lit (meaning, all the green background pixels are lit to be the same shade of green). How to recognize it in this video: Mac and Cheese cast no shadow on the background but Bottle Monster does. Mac and Cheese didn’t blend with the background entirely due to bad lighting. How it works: On the first pass, we shoot what’s supposed to appear on the left half of the screen. On the second pass, we film the right half. In editing, we put these two halves together using a matte (mask) where we show the left side of one video, the right side of another video, and then blend whatever that’s in the middle. Pros: This allows you to film the two characters on different passes. Perfect for two characters that occupy opposite sides of the screen. Cons: Neither of the characters can cross the middle line, or the illusion will be lost. (If they tried to cross the middle line, whatever crossed the line would vanish.) Sometimes the background colors of the two footages don’t blend very well and require extra corrections. How to recognize it in this video: Characters always stayed away from the middle line. In some shots the left background didn’t blend perfectly with the right background (which I paid more attention to in subsequent episodes but not this one). Bottle Monster’s dad’s fishing pole started to vanish a lil bit when it’s closed to the middle blending section. While the first method is easiest to do, the second and third methods give the characters the freedom to have arm movements. Both the green screen and the split screen method take more planning and require two passes to film each shot. 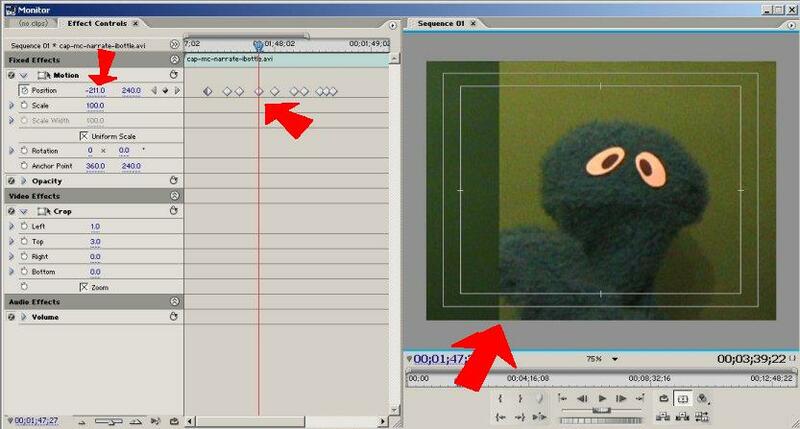 But hey, when you only have one puppeteer (or actor), you can still use these editing tricks to make two appear on screen. If you are confused by the first method, hm… I don’t know what to say. If you are confused by the second and third method, don’t worry. This is just an overview. More detailed step-by-step explanations will be posted in the following weeks. The effect that I’m going to talk about this time is the Sliding Curtain effect. (Actually, that’s what I call it. I don’t know what other people call it since I never really read about it somewhere else.) 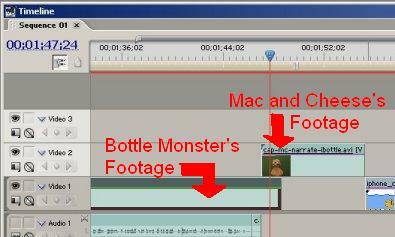 It was used in Episode 2: iBottle where Bottle Monster dragged Mac and Cheese’s video footage into focus as if it’s a sliding curtain, after saying “now, I disappear”. If you want to look at the effect, take a look at the episode and pay attention to time code 1:48 to 1:49 (if you are using the embedded video on the page, the countdown style time code would be from 1:52 to 1:51). As usual, I use Adobe Premiere Pro. If you use something else for editing, you can probably figure out ways that’s equivalent to what I did to achieve the same effect. So how do we achive this effect? It’s actually very simple. It’s just one video footage sliding on top of another, except that it’s timed precisely so the sliding speed of the top video footage coincides with the speed of the dragging hand in the bottom video footage. In this case, Mac and Cheese’s footage is being dragged so it needs to be in the layer on top. Bottle Monster’s hand is doing the dragging so his footage should be at the bottom. Layers or video tracks in video editing is very important in this case, because what’s on top blocks your view of the layers below it, so you must know what goes on top and what goes below it. Now select the Mac and Cheese clip and go to the Effect Controls window. You will see an item called “position”. Now click on the clock next to the word “position”. What this does is that you tell the program that you are going to be changing the position parameter as time progresses. This creates a little square thing in the timeline that indicates a keyframe. 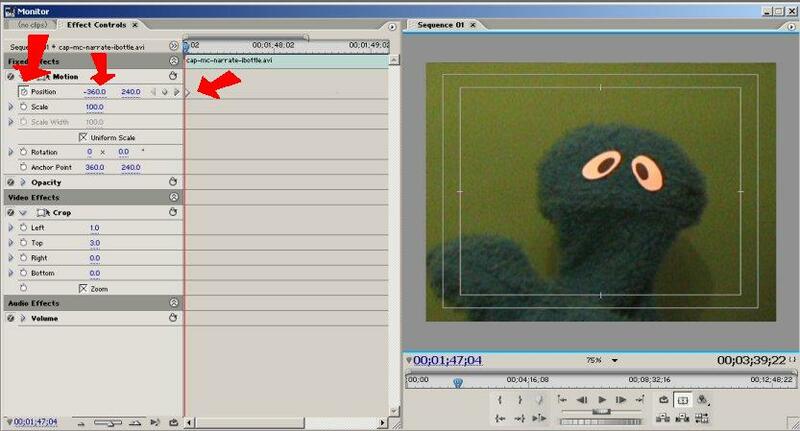 A keyframe is something indicating an important goal to reach (in this case, position of the clip) at a certain time. For the x value, enter -360. My footages are all 720×480 (yours might be different depending on how you captured the video) so setting x to -360 effectively moved Mac and Cheese’s footage to the left outside of the frame so it’s now invisible. All you see is the bottom layer in which Bottle Monster is ready to pull with his hand at the edge of the screen. And now you create a bunch of different keyframes by changing the position number of Mac and Cheese’s footage. This number should be between -360 (video is entirely to the left hence invisible to the viewer) and 360 (video is centered, filling up the screen and making Bottle Monster’s footage invisible at the bottom). See all those squares? Each of them represent a new position. Choose the numbers carefully so it matches Bottle Monster’s hand. And when you are done with all those steps, play it back to see what it looks like and adjust things. Yeah, I guess it’s a little hard to explain this with words. But as long as you are familiar with editing, just remember that you are moving the top video footage at the speed that matches the hand in the bottom video footage. That’s all you need to know to figure out the rest. If you are not familiar with editing, I really recommend buying a book or watch a friend edit. Once you are familiar with the basics, you can pretty much just mess around with the software to figure out the more advanced stuff. This is the book I used and I think it’s pretty good for beginners: Adobe Premiere Pro: Complete Course . Until next time, happy editing. Episode 4 is here! This week, viewer Paranoid asked Mac and Cheese and Bottle Monster what to do to defend our planet if there’s an alien attack. They have a little discussion and came to conclusion (well, Bottle Monster did) that Mr. Robottle is the answer to all this. What’s new: In this one I tried to do some stop motion stuff. I wouldn’t say that it came out great but it was interesting to try out anyway. Or should I call it pseudo-stop-motion since I didn’t exactly do it the standard way? Anyway, I’ll talk about that later. For now, enjoy the video! Quicktime stuff: Oh yeah, in case you are wondering why there’s an ad at the end of the mov version, it’s because I used Revver to convert that file. For some reason Quicktime wasn’t converting it correctly on my computer so I couldn’t do the conversion locally. Not sure why. The ad isn’t there for the m4v or YouTube version. Music: The music is Sax, Rock and Roll by Kevin MacLeod. It’s licensed under Creative Commons Attribution 2.0. If you have any thoughts, feel free to leave me a comment. Feedbacks are always appreciated.